When improvising, what your mind hears is more often than not determined by what your body can reproduce on your instrument. Much of your conception as an improviser is determined by your technique. If you can’t play certain types of ideas, you are simply not going to conceive of them while you are improvising. Even if you could, it wouldn’t matter, since you couldn’t play them anyway. There are many melodic structures that are physically challenging to play on the guitar. For example, anything that necessitates playing consecutive notes on adjacent strings presents logistical problems for both hands. This includes various arpeggios, triad-based lines, consecutive fourths, and large interval leaps. Since these melodic devices present such a challenge, the range of ideas in a typical guitar solo doesn’t include them. To expand the palette of musical ideas available to you as an improviser, you must expand your technique. The way to do this is to practice things that feature physically challenging motion. By playing lines that incorporate new and different types of melodic movement, you gain the technical ability necessary to improvise with these structures, and the sound of these melodies will gradually enter your musical consciousness. 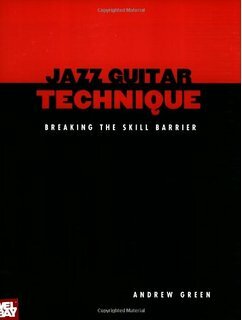 The exercises in this book will improve your technique, increase the range of your ideas, and open up new avenues of improvisation to you. You, in turn will have the opportunity to add to the vocabulary of what is possible to play on the guitar.